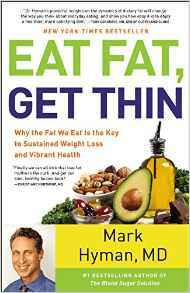 Eat Fat Get Thin Review. Why I’ll Never Look at Fat as my Enemy Ever Again. I just finished reading Eat Fat, Get Thin by Mark Hyman and I will say that any skepticism I originally had about this dieting subject is at rest, this book completely put me over the fence onto it. Originally the very first diet I ever heard of that had the “audacity” to suggest eating fat as a means of losing weight was the 3 week diet and because that was the first time I ever heard it, I was on board with the idea, but not completely into it, not until I finished reading this one. Anyway, I will explain to you the basic idea of the Eat Fat, Get Thin book, personally review the dieting style itself and let you judge whether or not you should do it. What is this dieting book about? Well in terms of the basic idea, the title says it, but the depth to which Mark Hyman goes into it is by far the deepest inside look into a subject I’ve ever read on dieting. There is actually a plan within it where you eat for 21 days, one way that is outlined and then you’ll have 2-3 options of how to “exit” out of the plan into a long term lifestyle. In terms of weight loss, there is a page inside the book which says that most people lose about 7 pounds in the 21 days with exceptions going farther. If nothing else, then the “fear” you have about fat should be put to rest. Mark devotes nearly half the book into explaining why we fear this word and the food that causes it and why it’s a misleading term. It’s very complicated. There’s different types of fat: saturated. monounsaturated, poly saturated and trans and the last one is the one which without any doubt is the worst, so there’s 1 distinction there. Not looking at the single nutritional aspects of the food you’re eating, but the overall food itself because in many cases, what you eat may provide both healthy and unhealthy fats, but as long as there’s more good ones than bad ones, you get the benefits from it. Ah the benefits, what can they actually be from eating like this? Mark cites a bunch of studies (really, there’s A LOT of studies) that prove how consuming too many carbs which is what many people in the western world do directly leads to higher insulin levels being produced as well as not enough nutrients being fed to the body and obesity arising because carbs when overeaten actually get turned into BAD fat. Considering how this over consumption is done in the western world by many and the fact (And Mark explains this) that the food pyramid in at least the United States points to eating more carbs as being healthy and adding to that the overwhelmingly high statistics of cancer/diabetes and other conditions rising in the country, one of the culprits may indeed be carbs. So that being said, where does fat segway back into this? Well by eating the right kinds, Mark says it will help you burn off the BAD fat inside your body, feed the brain (lots of the foods inside this diet plan have healthy cholesterol that is said to provide benefits to muscles and the brain), lower insulin levels and basically steer an unhealthy person who has overeaten carbs and is suffering from their effects to backtrack and improve their health. The detailed story and science is inside the Eat Fat, Get Thin book. As I said earlier, this plan is 21 days long and as you may have guessed, you’re eating a mainly high fat diet. Now what goes into this? For 21 days, you eat 3 main meals a day with 2 optional snacks provided. Water is allowed and barely a little bit of fruit such as berries are allowed. Now in terms of sample foods, there’s ones with high fat and low carbs that are allowed but basically, there’s about 50 main foods for the 3 meals you’re eating and a little over 50 for the snacks. One thing about this plan is that there is no calorie counting from what I saw because Mark points out that calories are not all the same and considering what types of foods you eat, they burn away differently. For the main meals: Anything typically with protein and fat is allowed such as chicken, elk, beef, bison, eggs, herring and other types of fish. For the sample snacks, you’re looking at various nuts, chia seeds, ginger, and just small things that are meant to help you get to the next main meal. Now vegetables are interesting in this diet because as I personally learned, many of them actually have starches and those get turned into…carbs. Mark provides a list of vegetables with…healthy carbs, basically those that don’t raise insulin from my understanding and provide you nutritional benefit, things like avocados, broccoli, asparagus and even sweet potato was something I saw in one of the meal plans. But while the examples here are few, in the book, you will get an index of all the foods that are available to you as well as a WHOLE bunch of meal plans you can create to diversify your diet. The first choice is to continue the same meal plan PAST the 21 day period and that is recommended if you have more weight to lose or haven’t reached the target goal you set. The second is what Mark calls the “Pegan diet” which is a combination of eating in a vegan/paleo style for the long term for which there is a part of this book that devotes several sections and stages to explain how it works. Mark says he is a big fan of the Pegan diet because it can offer long term benefits. 3.5 out of 5 stars. With all the evidence provided for it, there is little doubt this diet works and/or is healthy for you. It is a strongly recommended try because it basically goes in the opposite diet suggestions that have been around for years, but have still seemingly not provided a decrease in obesity and other conditions. Is this diet recommended? And if so, for who? I would say that anyone who has excessive weight issues, obesity, diabetes, the likelihood of heart disease and other conditions at least look over this plan and consider following it, especially if the current things you’ve been doing have not worked. Is there anyone for whom this diet will not be suited for? Better solutions? Well I believe everyone who does it will lose weight and if that is the priority and the goal is ONLY that, and a lot of it, then you may want to try a diet plan that has 10 options (I briefly talked about this above), all of which are great for fat burning. I absolutely love both plans and strongly recommend either of them. You will lose weight by eating fat from both plans, but one will provide faster results. Both plans function on a similar, none orthodox understanding of why people can’t lose weight easily and how to solve it and that makes them both special plans worth checking out. After reading both of these plans, I have completely rethought what I think and know about the subject of fat and recently repurchased myself a bottle flaxseed oil and the seeds themselves so I can eat them, among other food choices that people would think would add weight to me, but I have full confidence in that it won’t and will only improve my health thanks to the knowledge from this plan (and the other too). I’ve done elements of both plans Dennis. Eating high fat foods, high protein meals and generally sticking to eating less sugar made me drop almost 10 pounds in 2 weeks. Now I am confused, so many perceptions out the door and in with the new. I have to say you have been very thorough in your review and I have the desire now to read this book and try this 3-week diet. I wonder do you still remove the skin from the chicken or is that out the door too? What are the issues if you already have a heart condition or diabetes? Considering the fat on chicken skin is good for you, I’d keep it, unless you don’t like the taste of it. As for heart disease and diabetes, I think the best thing to do is to speak with a doctor. My personal, NONE medical opinion is that high fat is good for helping with these conditions. It’s typically carb consumption and letting that create a lot of fat in your body which feeds the problems you listed. I haven’t read Mark Hyman’s book but have a good friend who was singing its praises in the way that the truly converted do lol. I’ve always believed that the biggest culprit to being overweight is too much carb consumption. I love bread but try to stay away from it as much as possible because it’s just empty calories. The part about many veggies containing carbs is surprising and little alarming since I eat tons of them. Are you referring to potatoes and corn which I know about already or are there others to steer clear of? I have always thought of vegetables as about as innocuous a food group as there is. There is a list in the book and I think that broccoli may even be one of them. If not that, then spinach, but either way, you will get a good list of foods for reference. Where can I go to find good fat vs bad fat without buying the book? Well I gave numerous examples of the good types of fatty foods in this article, but you can also look up on Google a list of healthy fatty foods. Oh no please don’t tell the Americans that they have been wrong all along, carbs are good! ( well not but anyway). The perception we have of dieting is totally wrong. Many people see dieting as a starvation race and get mad even when thinking about fats while the main problem are carbs and sugar. Especially since sugar is everywhere. I like what I read and the fact that it challenges the traditional way of thinking towards dieting. Thank you John, it is true that the american way of eating and dieting is flawed in too many ways and what would be considered “not traditional” within this book is actually more traditional because it is actually the right way to eat and lead a healthy life. You are absolutely right when it comes to fats. Although in my younger days I fell prey to the media and it’s bad representation of fats. Recently though i have learned fats are actually good for us in moderation. Saturated fat is especially good for raising testosterone levels. I will definitely check the book out as i need to lose some weight reasonably quickly. Only thing I will not touch is avocados, I felt sick after trying one. Never again. You may have had an expired avocado, but it is also possible your body has a resistance towards it. Regarding the media, the problem is, there are DIFFERENT kinds of fats and the media just clumped them all together and said it was bad, it’s one of the reasons I no longer watch or listen to them. This book breaks down the different types of fats there are and which ones you really want to stay away from and which ones you want to eat. Since I’ve updated my diet after reading this book, I’ve seen great improvement in energy, restoration of muscles, joints and other things. I have always been a fan of healthy eating and always trying to eat less fat. I have always been under the impression that consuming less fat is the right thing to do until I read your review of this book. You have given me a totally different picture now and from your review, I get a clearer view of where that unhealthy fat is coming from in our diet. Your review has also brought to light how this 21 day diet plan works and I am happy to note that it spells out what to eat and its nutritional benefits. Though I do not have a weight problem as such, I am surely going to try out the guidelines that have been spelled out here. This has been an eye opener and I would seriously consider buying this book for a better understanding of the diet plan. Does this book give any insight into a diet plan for vegetarians? I don’t recall but you can just omit any foods that aren’t vegetarian friendly. Yeah this type of dieting is my favorite. I think the reason people get fat in the first place is primarily refined carbohydrates! Not fat found in animal products, more and more people are finally realizing this as we were informed wrong for decades. Now science is showing otherwise. Personally, I feel great cutting out all added sugars and keeping my total sugar levels to about 25 grams a day. I would imagine that is about what this book recommends, right? 25 is pretty low but this book is not one that recommend a cold turkey approach to sugar/carbs. You can eat them, but if you need to lose weight, you need to drop the carbs and eat more healthy fats and typically the types of fats that also have protein. I’ve had personal trainers tell me as long as you eat under 50 grams of sugar, you should still lose weight. Of course this is also in addition to exercising. Yep, eating fat just goes against my diet grain. But the book sounds interesting, and this diet seems a lot easier to do than most others. I don’t see how it could possibly work, but I might have to get the book and give it a try. Sounds simple and the food sounds more flavorful. Looking at what it has done for you, makes me hope I can have similar results. I work out a lot too, and I can see the benefit of fat for joints. Worth considering for sure. I do understand why and how a high fat diet can work. Put simply Cholesterol has a lot of bad press, but it is actually good for you (but not in excess) and I is essential for hormonal balance for both men and women as it is the very building blocks for testosterone which builds lean muscle and has lipogenic capabilities. Personally, I am seeing a link between lowering testosterone levels in men as well as women after the age of 30 and an increase in body fat. Hi Vitaliy, I’m a vegetarian and wonder if I could try this method too… Obviously I can’t go Pegan diet, but I wonder if animal protein is a necessary element in Eat Fat Get Thin method? I don’t have an excessive weight issue but I would love to lose weight. It’s great to know that it’s important to eat fat though. I tend to try to avoid fatty food completely – so this is an eye-opener for me. Your recommendation “3Week Diet” seems more flexible but a little more costly, whereas Eat Fat Get Thin is a handy book and cheaper, do you think it’s worth buying for vegetarians too? The 3 week diet will also have a fat eating phase, but it’s 4th phase will simply tell you to eat less than you normally are and it may be enough to hit your target weight Ray. However, regarding vegetarianism, there are some with high fat dosages that you can Google, but some of my experiences and searches show that avocados, olive oil and nuts hold good amounts of fat which you can use. I think it’s been almost 3 years since I tried being vegan because I thought it would be enough to make me have the desired weight that I always wanted. Alas, I was wrong because I didn’t get to follow it that well because of my love for meat and I know there are other fun ways to make losing weight a thing I can look forward to. After reading your review though, I sort of became a fan or maybe interested in purchasing the book because I’m curious of trying out the thing myself. Being a religious diet follower myself, this made me more excited than the usual. I do know the fats sometimes get a bad rep but I’m glad he focused on his book about the healthy fats we can eat and actually benefit from it. Not to mention, healthy fats can be the main reason why you’re not getting diseases right now such as diabetes as long as you have a particularly healthy lifestyle. I think by reading Mark’s book, I will be able to see how this fruition came to be and be able to apply it in my life and to other people I will be recommending this book to. I’ve been a fan of Dr. Hyman for a while. He has lots of credibility with me. The idea of eating fat to lose weight is strange to some people. At first it seems counter-intuitive. Once you distinguish between so called good and bad fats, things make more sense. Other material of Dr. Hyman’s I’ve read were well written. By that I mean they were easy to understand and flowed nicely. What are your thoughts on the actual writing of the book? Was it easy to read and or fun? Yeah I didn’t have a problem understanding his points and the writing was normal Mitsu. I wouldn’t say it was fun, but the topic was so unusual and controversial that it made the book necessary to continue reading. We need fat in order to live properly. In the ancient times, people stopped eating fats, and their skin lost nutrition and they started flaking. Nowadays, we know better. It’s important to eat fat. Not just any kind of fat of course. We have to eat the right kinds of fat. The fat from nuts are the best. It’s best if we can get some omega 3 fatty acids too, because they help prevent heart problems. If you can prevent cardiovascular problems, you can also fight diabetes, because those two problems have been linked together. When we get fat, our fat cells actually release something known as resistin that signals cells to stop the intake of insulin and glucose. In other words, that’s the start of diabetes 2. People should know that not only for weight loss, but also for health purposes. This article shall make everyone aware that fat is not the real enemy, rather, bad fat especially trans fat is the culprit. For my weight loss program, I still eat healthy fats like avocado, nuts and peanut butter. It might sound controversial, but it works, it makes me feel full. The more I read about burning fats and losing weight, the more I feel I don’t know about them. It’s a good thing that I came across this review, as it gives a different perspective on fats. So not all fats are bad, and some of them can actually help us burn the fats that we don’t need. This is something that everyone should consider, and this book should be a great help in this issue. Me and my wife are trying an all natural diet of eating gluten free food. I like what you said about fat and how misunderstood it is, there is good fat and bad fat. Plus having too much of a good thing, is probably too much. My wife keeps coming up to me and telling me how much she’s lost so far. Thank you for your post. A few years ago I went vegan for almost two years because I read a book that scared me into it. I will say I lost some weight and could eat a lot without gaining it back but I found myself eating a lot of processed carbs which didn’t feel good. I can already tell you this plan will work because I have been following it (came from a different source) for almost a month now. I have been weight training as well so the scale hasn’t moved much but I have lost 3% of my body fat so far. My goal is to continue for another 2 months and see where I can get to. You did lose weight Jeremy, but it was fat, however, the scale didn’t tip either way because you have probably gained muscle which substituted the weight change and made it 0, which is not a bad thing at all! Great review. I think that this eating plan by Mark Hyman makes sense. Not all fats are bad for you. I like the fact that he has included an exit plan from the diet and ease into a longterm lifestyle of eating properly. Three weeks is not a long time to commit to something but I think those considering this must understand that they need to adjust their lifestyle as this is not a quick fix to lose weight. Dr. Hyman’s advice on losing weight actually makes 100% sense. The biggest misconception of dieters is that they think that you have to cut out ALL fats, carbs, and sugary foods. The truth is one can really eat them as long as they eat them in balance. Meaning in small amounts, or only periodically, weekly, etc. I myself am an example of this. Great review!